Dr. S Venkat is an Associate Professor in Operations Management at IIM Lucknow since May 2013. He has around 27 years of teaching and research experience. He was a Postdoctoral Research fellow at Singapore MIT Alliance (SMA) Program, Nanyang Business School Singapore, worked at Honeywell Singapore as a SCM Lead Engineer. He was a Fulbright Scholar at W P Carey School of Business, Arizona State University, USA during fall 2009. He worked at IIT Madras and IIM Indore and IIM Kozhikode before joining IIM Lucknow. 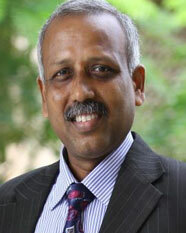 He was the coordinator of Center for Excellence in Manufacturing at IIM Indore during January 2007 and July 2012. Published around twenty research papers in peer reviewed international journals like Journal of Health Management (JHM), Asian Case Research Journal (ACRJ) Operational Research Society (JORS), International Journal of Production Research (IJPR), International Journal of Production Economics (IJPE), Production Planning and Control (PPC, International Journal of Advanced Manufacturing Technology, International Journal of Technology Management and Sustainable Development, International Journal of Indian Culture and Business Management etc. He published around fifty papers international conferences like INFORMS, POMS, DSI, ICPR, GT/CMS, ICOQM, SOM, ORSI etc. He authored four book chapters and a customized book on Production and Operations Management. Include Supply Chain Modeling, Healthcare Supply Chains, Public Health Management, Operations Scheduling with energy efficiency, e-procurement and Operations Management in Service/Religious Organisations. Ph. D in Operations Management from Anna University, Chennai (2001). Conducted Management Development Programmes (MDPs) in operations management, supply chain management, manufacturing excellence, healthcare delivery. Conducted customized programmes for organisations like Honeywell, Tata Motors, NTPC, Indian Oil Corporation (IOCL), HPCL, HAL, SBI Cards, SBI Life, Bajaj Finance, Pharmaceutical Companies.